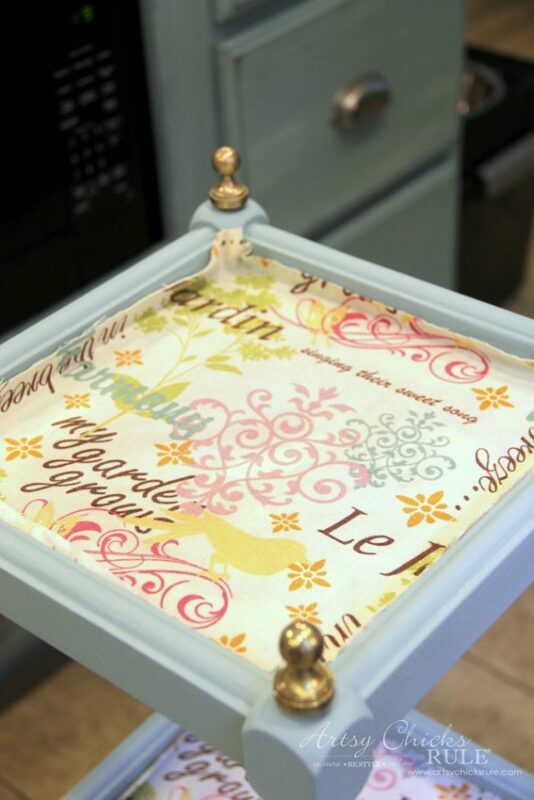 This thrifty table got a brand new look with French fabric decoupage! Love, love, love this day every month. 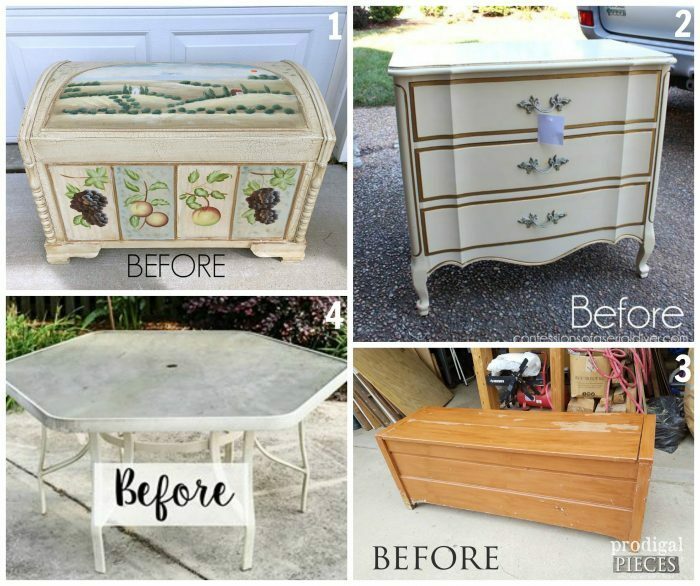 :) If you are new here, a few of my friends and I get together once a month to share our trash to treasure transformations. 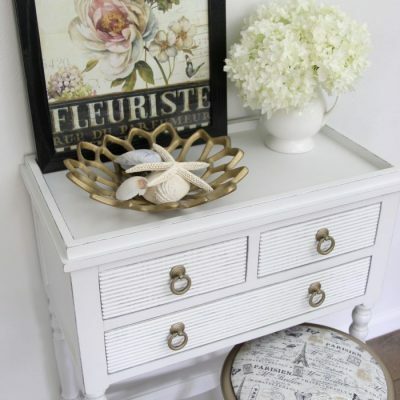 It can be anything from furniture to decor, repurposing, whatever! 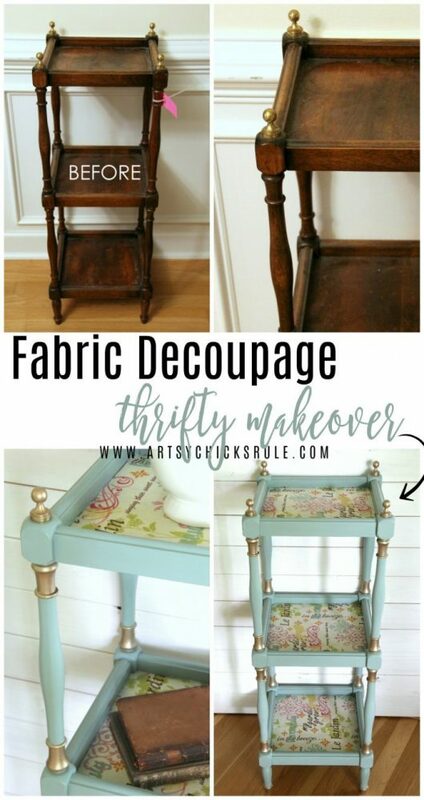 Today I’m sharing a little fabric decoupage on a thrift store find. Actually, I believe I found this one at Habitat ReStore. If you follow along on Instagram, you probably saw me post about this one when I got it! I always post things over there when I find them and as I’m giving them makeovers, etc. 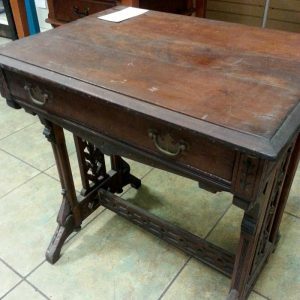 This pretty little table was $7 and in pretty good shape, just a little dirty. 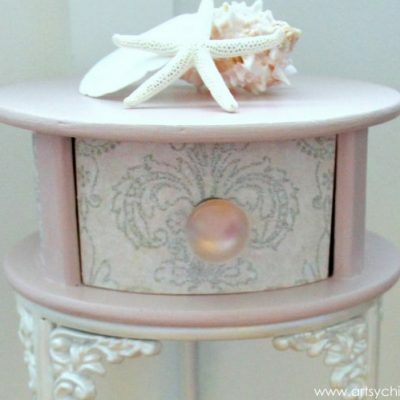 My original vision for this table came from some pretty wrapping paper I have that is pink and green. 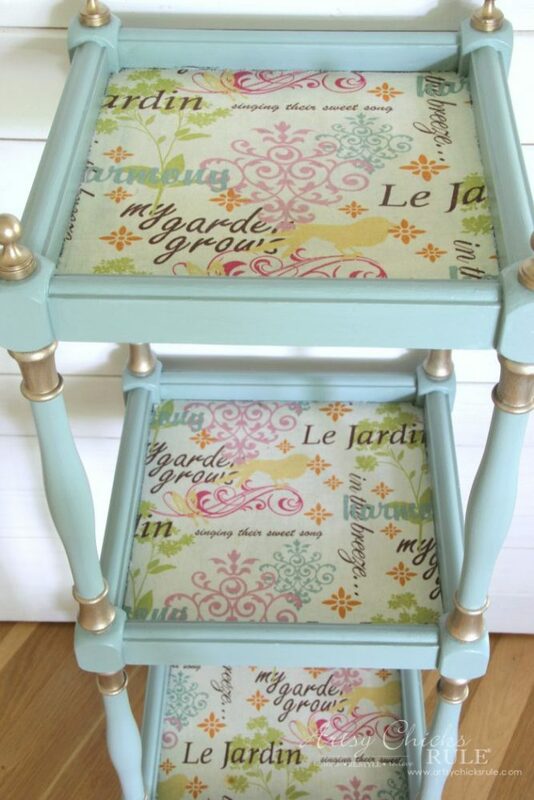 I thought I’d decoupage each flat surface with the paper and paint the rest green. After painting about half of it I decided green was not working for me. So I painted the whole thing pink. Ha, yep!! That wasn’t working for me either. Bummer. That’s when you want to just throw in the towel for a bit. But I couldn’t because did I mention that this was Sunday night at about 11pm? Ha, yes, it was. I had been so busy around here I totally forgot about my girls and our fun trash to treasure Tuesday coming up. So I couldn’t throw in the towel! I had to figure this thing out asap. I went up to my office/craft room and looked through my stash. 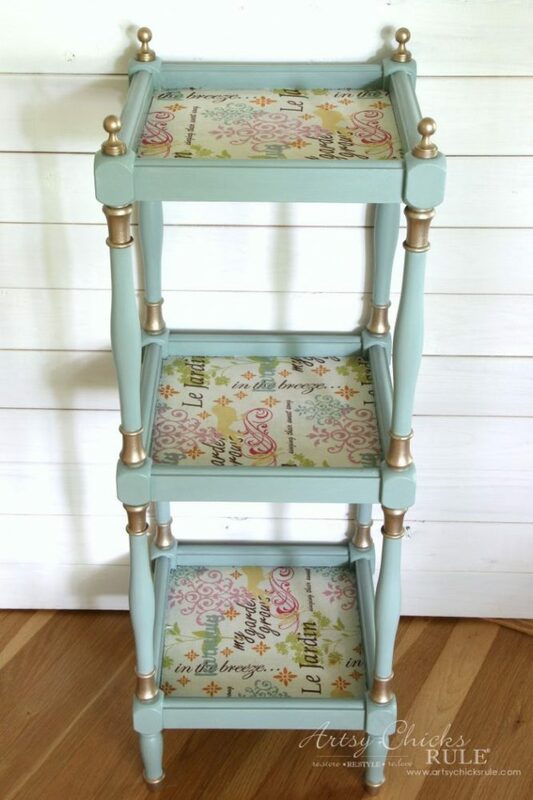 I came across some of the fabric I used on these chairs and thought it’d be perfect! So I grabbed it and ran back downstairs and got back to work. 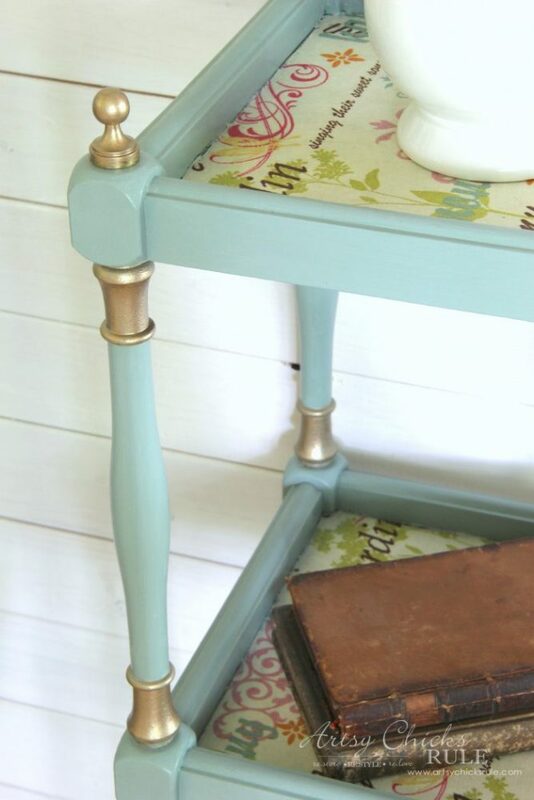 I decided on Duck Egg Blue Chalk Paint for the trim since it matched some of the print in the fabric perfectly. And I just love pink and blue together. I cut the fabric about 1/4 to 1/2 inch larger than I needed all the way around. And I found this in my stash for the fabric decoupage…. …and decided to use it. I think it maybe came from one of the blogger conferences I went to. I slathered the decoupage fabric glut onto the top and then stuck my piece of material to it. I smoothed it out to make sure there were no lumps or air bubbles. You can see above and below the excess material. And the Duck Egg Blue paint, of course! ;) Love that color. Once this was dry, I used an Xacto knife to cut the excess off. Not perfect but it worked okay. 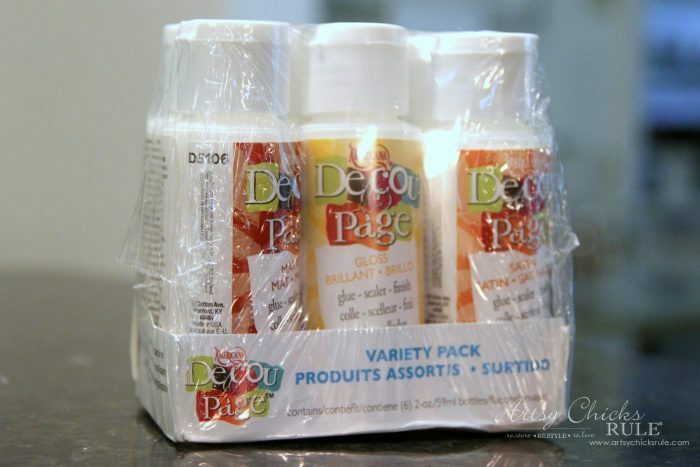 Next I used this sealer to seal it up and give it some protection. I did two coats, drying fully in between. 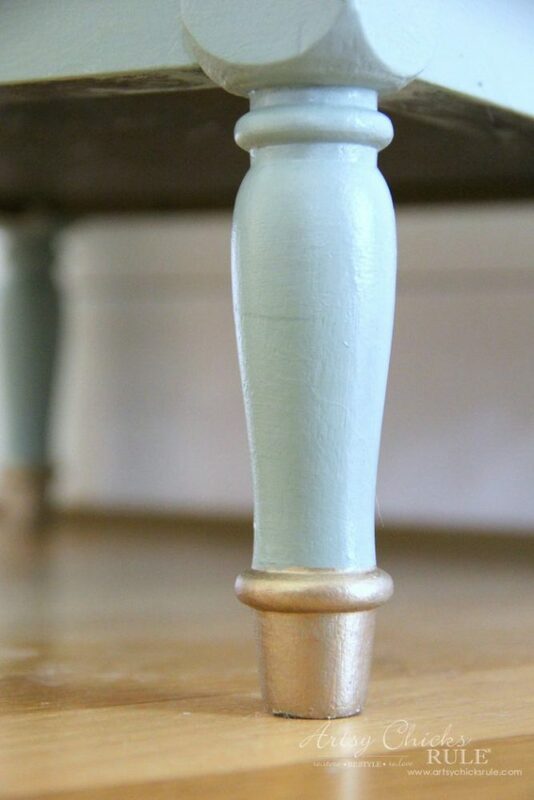 I also used the same sealer on the Duck Egg Blue paint. 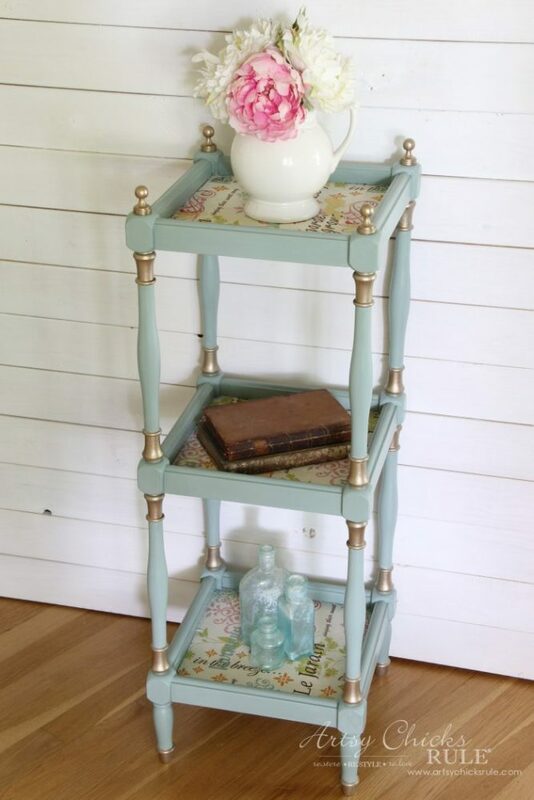 I came with the pretty brass knobs on top but I thought it looked a bit plain on the rest. I’m kind of thinking I needed to paint the upper little twirl gold too. As in keeping with the rest of the design, I probably should have. So, I’ll have to go back later and do that. What do you think? Paint it or let it go? 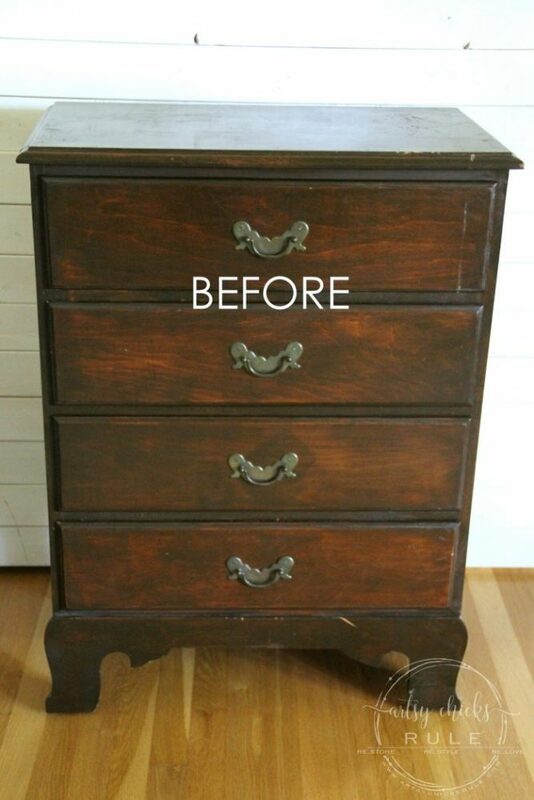 As I mentioned before, the knobs are brass but they were stained and I couldn’t get them all the way clean. 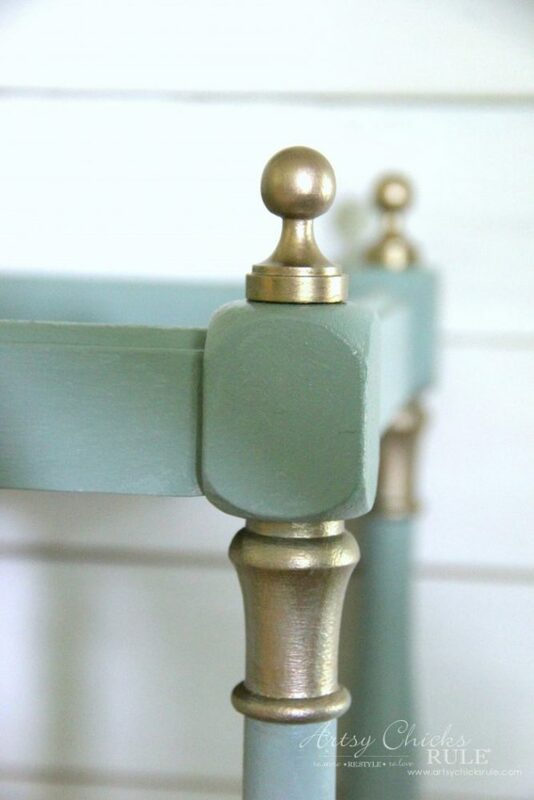 They were also more “brassy” than the paint….so I painted them to match! SO glad I did, they look so much better. I love these artificial flowers. They are so pretty to me, fake or not. 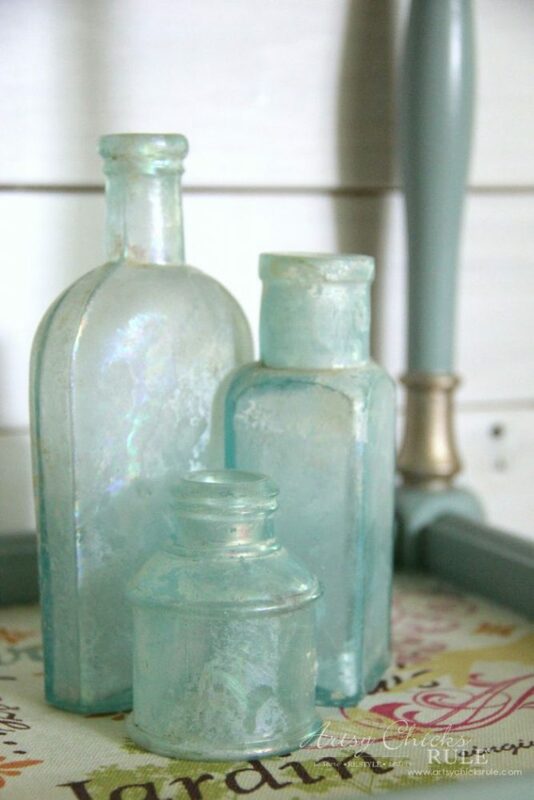 And of course my favorite antique blue bottles….. 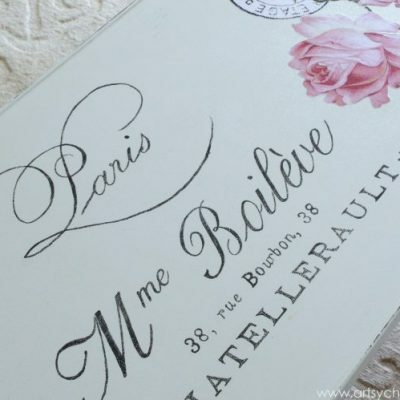 Pink and blue …two colors I just love together. 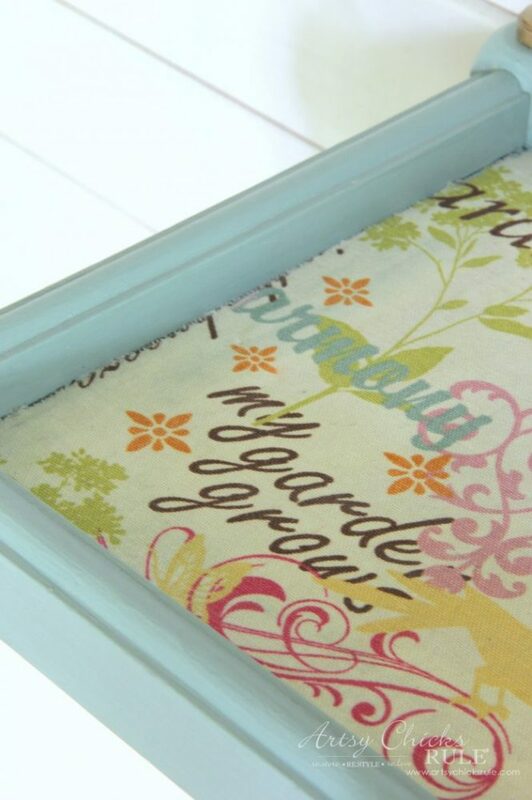 PIN this fabric decoupage project to save it for later! You might also love this one below!! Want to see even more Trash to Treasure Transformations? Click here to see more in this series. UPDATE!! See it how, here! I love these colours, in fact, I love everything about this piece. The gold really looks good and lifts the whole thing our of ordinary and into awesome! 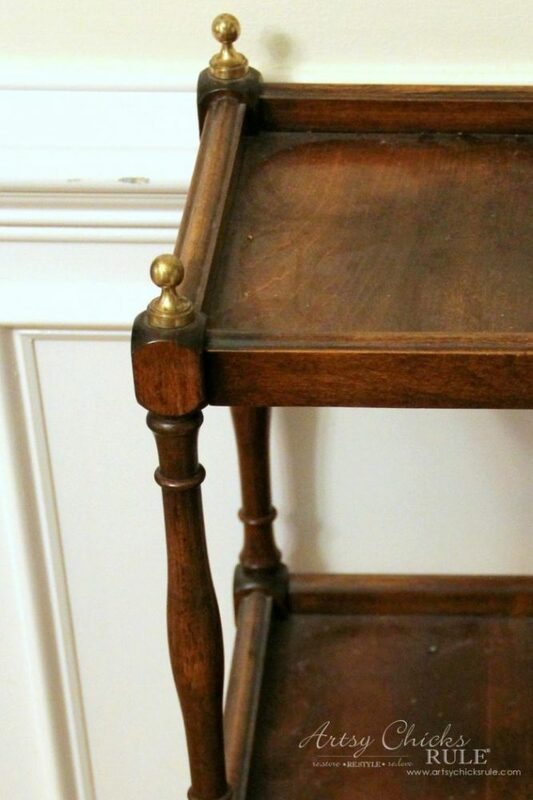 Love this table. The colors are beautiful. I followed the link for the gold paint. It takes me to Amazon. There is more than one gold color option. Would you please tell me which gold you used. I love the little $7.00 table. 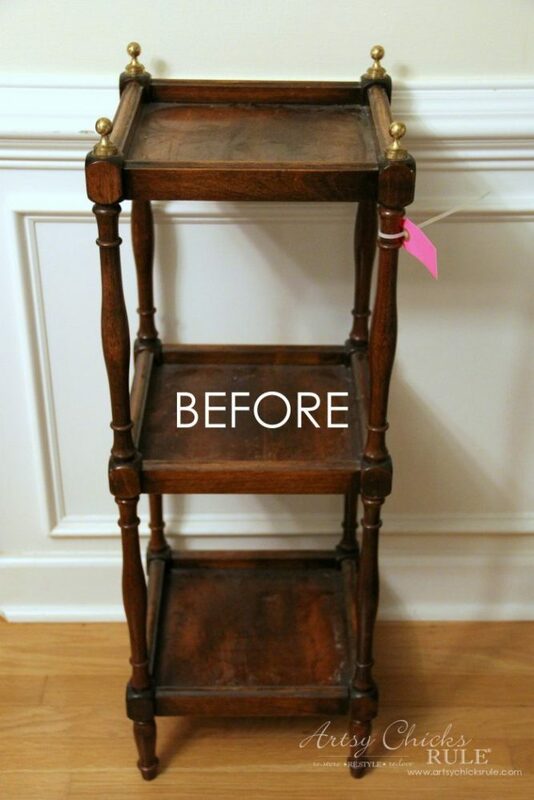 I keep telling myself to go out and find a thrift store near me and find something I can redo. Maybe in the early fall. Girl, despite your trials, you still rocked it. I love the fun new look and the fabric took it over the top. Pinning! Just a beautiful job, so sweet! I like it just the way it is now. This is a great update for this piece! 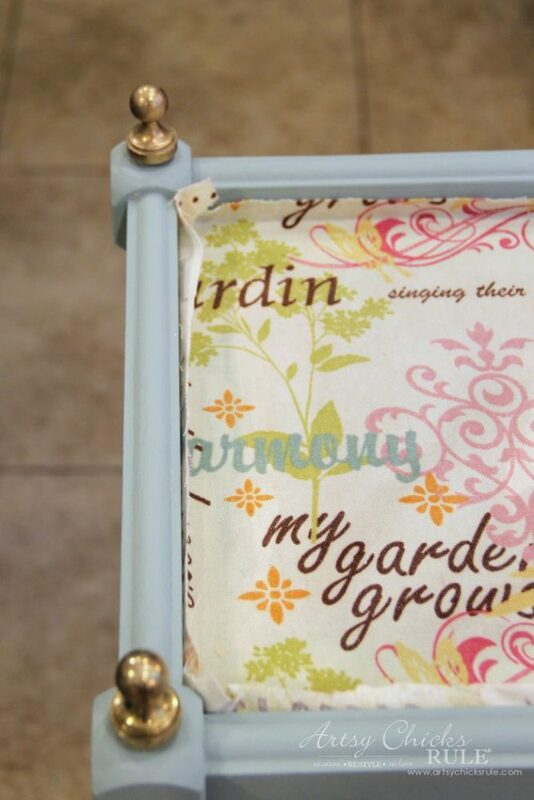 Love the colors and the fabric. Such a beautiful piece! Pinning this. Lovely transformation. More gold trim would overwhelm the piece. I love how the piece turned out! It is a beautiful makeover. The gold adds the extra pop. I appreciate that you admit to having failures. I was beginning to think I was the only one to experience the fun of failure. No more gold paint. It looks marvelous, despite the headaches! Wow. Just wow! That is one beautiful piece. It’s perfect….the blue and gold are stunning. Yes, I’d paint the ring around the bottom leg part. It would finish it off perfectly. 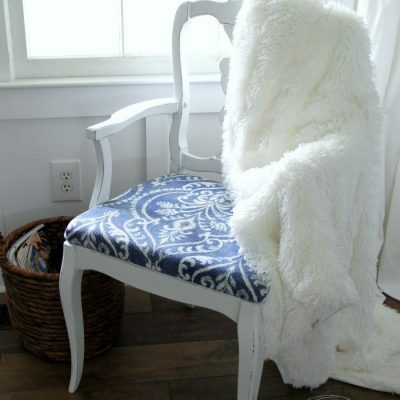 The fabric, the colors, the style of the piece…. Five stars! I love the little gold painted highlights. Such a great idea! So cute, those colours are so pretty Nancy?? I just love this piece! The blue is amazing. Nah, you don’t need any extra gold. It looks perfect!! It looks great, but I do think you should paint the lower twirl so it’s in harmony with the rest. Other than that, it looks great. Oh gosh, I love this makeover. And putting fabric on the shelves is just perfect. You are right, gold on the tops was the finishing touch. Love it! Typically, I’m not a fan of painting great old pieces like this – but this one really is a cute one. I love the color scheme. I want to update my China cabinet but I don’t think I want to make as permanent a commitment as decoupage. So what I’m thinking is covering cardboard or foam core with a fabric and loop hook tape to hold them in place on the backs of the shelves. 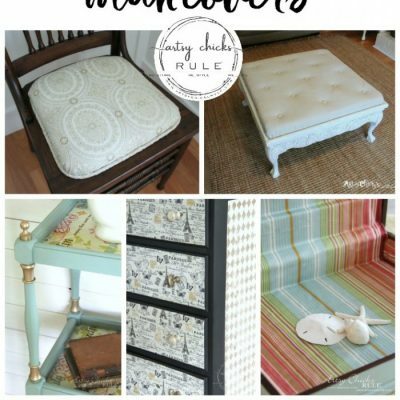 I could change or remove as docor changes like reupholstering my dining chairs. 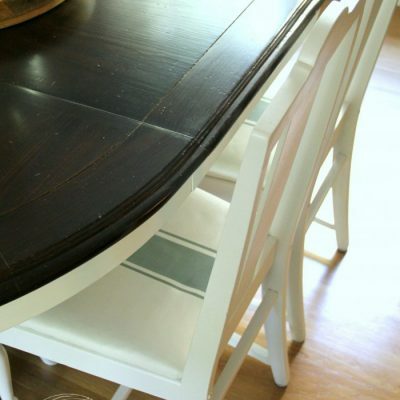 I have this exact table! It was handed down to me. I’ve used it in so many ways over the years. It has gotten boring and less attractive from all of the use. I came across your post and am excited about my “hand me down “ again! I can’t wait to bring it back to life. Thank you for posting a piece that is different. Those are the pieces I have and love the most. You are my new go to inspiration! 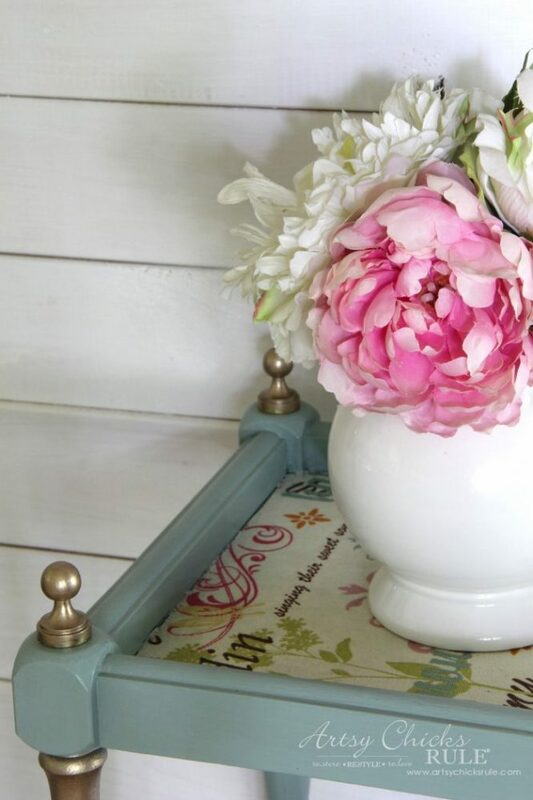 Love the blue you used on this table. It’s nice and timeless. It’s one of those colors you won’t tire of. I’m in the small group that thinks you should paint the bottom ring gold to match the rest. It’s not very much so it shouldn’t overwhelm. But it will match the rest. I would like to know where you found the artificial flowers. They are very pretty. 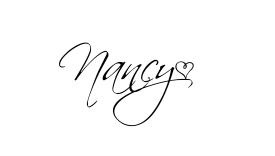 Thanks Nancy. I have been planning a trip to Michael’s, so I’ll check to see what they have. I have to confess, I’m generally opposed to refinishing wood furniture with paint. You just changed my thinking. 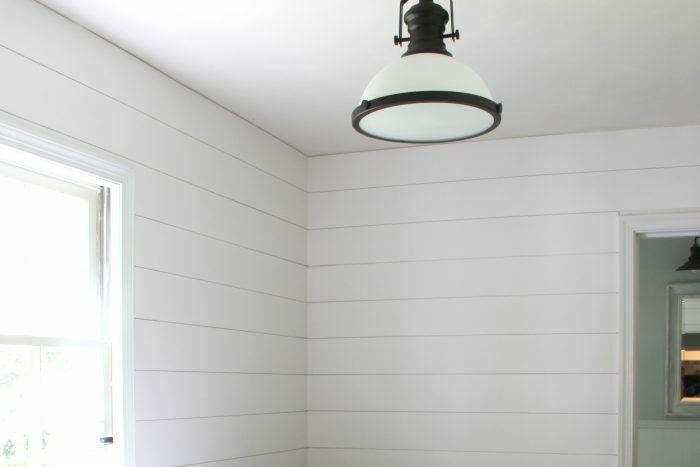 I checked out your link to the 26 types of chalk paint. Thank you so much. This reference cut down a lot of research time.